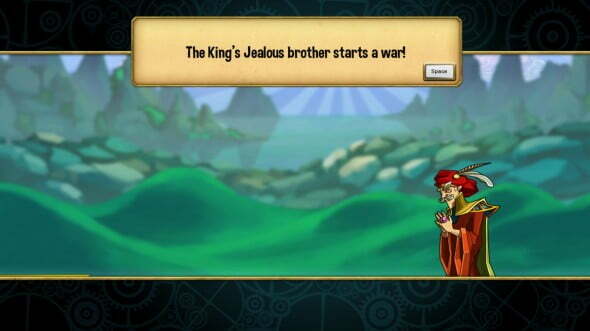 Cannon Brawl tries it’s hardest to combine elements from real-time strategy games with tower defense. But how successfully does it do this? When I first booted up Cannon Brawl I heard Ron Burgandy’s voice shouting the game’s name. Now, even though he shouted “cannonball!” before diving into a pool and not “Cannon Brawl” the madness, excitement, and aftermath of said declaration should give one a good feel for how Cannon Brawl actually plays. In a word, insane. In two words, insanely insane. However, just like anything good and crazy, it is better to have it in small doses and Cannon Brawl’s frantic mechanics eventually grow wearisome. Hope you brought enough helium for the kingdom’s seemingly endless supply of balloons. Turtle Sandbox’s 2-D real-time-strategy-meets-tower-defense game is all about speed, reflexes, quick-thinking, and victory or remorse depending on the outcome of each match. At first it looks a lot like Team 17’s Worms. It’s 2-D, the terrain is destructible, and there are many explosions, but that’s where many similarities end. Instead of weapons, there are stationary buildings with weapons mounted on them. Instead of turns, everything is happening at once. This is a game created with the sole purpose of delighting and infuriating the player at the exact same time. Before the match, you choose your pilot. There is quite the cast of characters all with different abilities. Some have cool down reducers or heal buildings; others have more intriguing abilities like the drill which can be used to destroy terrain and bury the enemy’s buildings. Once you begin the match, you start with an HQ which, come hell or high water (or missiles or cannon balls), you must protect at all costs. You also start with gold which is used to buy buildings. You build these buildings with your handy-dandy airship by buying them at the headquarters and dropping them off where you need them most. The first type of building is the mine, which will generate gold. You earn gold over time and the more mines you have the more money you’ll earn which then allows you to continue to build and expand. There are also balloons which, like the pylons of Starcraft fame, allow you to expand your empire-building area which, in turn, make it possible for you to build towers which come in a See’s-box-of-candy-like assortment. There are cannons which fire like mortars, towers which fire bombs that walk when they land, missile towers which fire a shotgun-like spread and rain hell-fire, laser towers which shoot an intense direct beam of death, and more. Well fear not, old chum, there are defense towers galore which can help you stave off a trip to an early grave. These come in a variety of shapes and sizes such as a defense satellite which reduces (or completely negates in terms of the laser towers) blasts, repair towers which when activated allow you to heal certain buildings within range, and more. Every offensive structure can be nullified if you properly set up a good defensive network. This may sound like a good time and it is at first. As your empire grows, however, keeping track of multiple cool downs can become exhausting. Worse, controlling your airship can be a pain when your buildings are too close together as it is hard to tell which building your clicking on due to the size of your airship and in a game that is all about speed and timely reflexes these mishaps can cost you the game. And this is true for both keyboard and controller although I found the controller to be the better option of the two. Well of course he did. Anyone with the name Jealous would be rightfully upset. 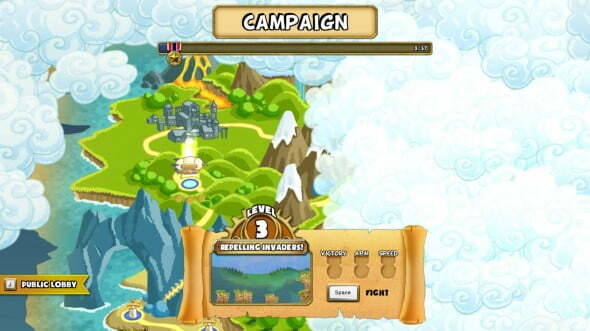 Cannon Brawl’s campaign has as much depth as the game has dimensions. There’s a good king and there’s an evil king (who is your uncle). And, like the beginning of a Disney movie, you begin as the princess and set out on a quest to save the kingdom. Trumpets blare in the background and before you know it, you’re smack dab in the middle of Cannon Brawl country. The campaign starts slowly and introduces the different pilots and buildings one by one. There are some interesting maps, like battling a giant, moving warship, but besides some silly conversations the story is pretty dull. The campaign’s map structure, however, is reminiscent of Super Mario games and your airship goes from zone-to-zone on the map. You can always go back and try and do better on a previous level or you can just push on to go do battle with King Jealous. Cannon Brawl also includes bonus puzzle levels which unlock using medals earned during the campaign due to completing certain optional objectives within the campaign. The puzzle levels are a nice breath of fresh air with objectives ranging from one-shotting an HQ to surviving a bombardment like the old arcade game Defender. With Cannon Brawl basically being the lovechild of an RTS and tower defense game, one would expect a heavy competitive online presence. But during my brief relationship with multiplayer I found that there weren’t many players willing to do battle. This was a disappointment because going man-to-man with another human player was much more fun than against the one dimensional AI. 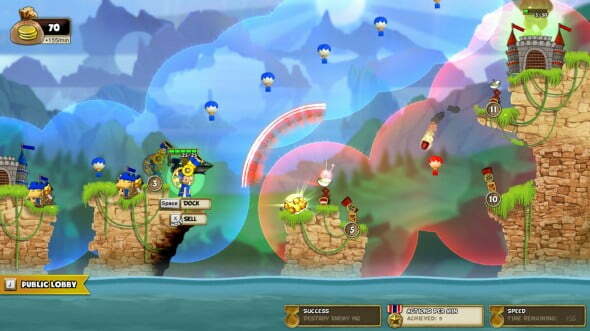 As stated before, the graphics are very similar to Worms with cloud explosions and battle damaged terrain. Everything is brightly colorful and cartoonish which makes it easier to act like a xenophobic, homicidal maniac and destroy everything other than you. The music is rabble rousing and heroic and, again, makes you feel good about blowing up anything within your towers’ reach. The explosions sound like something recorded straight out of a Looney Tunes cartoon as do the laser towers which power up before unleashing their destruction. Sure, I sweated and swore and beat my desk with my fist occasionally due to some issues, but after every match, after every level in the campaign, once that victory screen popped up and the trumpets heralded my opponent’s defeat, I felt pretty good and clicked continue. All in all, Cannon Brawl is a fun and intense 2D RTS and Tower Defense game and, although, as you continue to play, it loses a little of its charm and it has some mechanical issues (as well as a lack of a greater online community) it is a fun treat to be enjoyed now and then when your urge to blow something up becomes too great and you need an outlet.